Insects play a larger ecological role than one may realize, as they are dominant in virtually all habitats. Their small size allows them to survive on fewer resources and their short generation time allows them to adapt to environmental changes and evolve quickly. Each type of insect has a specific ecological role in its respective habitat and ecosystem, and over the history of the Earth, they have strongly influenced the way plants look and function today. Plants have been able to diversify and specialize overtime the way that they have because of their strong connection to insects and this phenomenon is known as co-evolution. Genetic mutations that occurred in plant and insect species in the past that were beneficial to the interaction (and thus beneficial to reproductive success of both), were retained in the populations via natural selection. They evolved together and eventually branched off, following similar patterns. Plants are immobile, and therefore to avoid inbreeding, they must rely on mobile organisms to bring the pollen to them. As plants diversified and specialized, they began to acquire specific and loyal insect pollinators. This means that in order to optimize reproductive success, reproductive organs (flower) of the plant must be morphologically optimized for the access of the specific insect pollinator. Changes to the plant that allowed the insect to favor the species, creates and ensures a faithful relationship between those plant and insect species. The pollinator benefits because it receives nutrients from the nectar, and the plant benefits because its genes get passed on to the next generation. Each plant is best suited for its own pollinator and each pollinator is best suited for the plant it feeds on and pollinates. To continue with orchids, the orchid mantis (Hymenopus coronatus) is a very special insect that particularly caught my attention. I did some investigation about how such an inset came about. As mentioned above, the insect pollinators benefit from the nectar of the plant, however, the orchid mantis, took advantage of co-evolution in a very special way, reaping very unique benefits. Praying mantises are insects that prey on other insects and why go out and chase after other insects, when you can just sit on a flower and wait for one to come by? 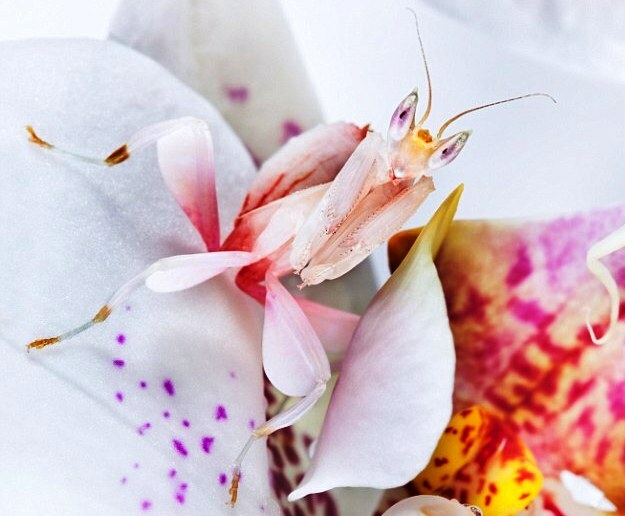 By disguising itself to look impeccably like a flower, the orchid mantis hides in white and pink flowers, waiting for the unsuspecting pollinator to come by. This is known as the mimicry theory, wherein the mantis increases its fitness (ability to catch prey and avoid predators) by resembling unrelated organisms. It is likely that the orchid mantis came about when a praying mantis ever-so-slightly resembled a flower and was more successful at catching prey because of this. Passing on its genes to the next generation, genes that allowed the praying mantis to even more closely resemble a flower persisted in the population, eventually evolving into the orchid mantis that we know today. So here is the fun part, are these flowers or insects?